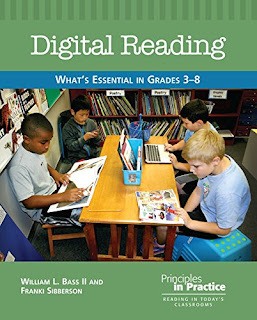 The opening chapters of the book focus on how to define digital reading and how to incorporate it into your current reading workshop. What I especially appreciated about these chapters were the vignettes - especially the comparisons between two example students. This really helped me visualize how digital reading could work well in a classroom setting - and how it could work less well. There is a great multi-page questionnaire to get teachers thinking about the role of digital texts in the classroom. For myself, I have not yet made many strides towards using digital texts. In past years, I have had the occasional student bring in a device to read a book during read to self time, but that has been about it. We started blogging this past year, but mainly used our blogs as a way to share writing and book recommendations with a few partner classes. The only time I have used digital texts with students has been displaying excerpts on the SmartBoard during writing workshop or sharing Love that Dog. (Because the book is written as a poem, I wanted students to see the words as well during our read aloud.) We are not a 1:1 or BYOD school, so I have not yet done any work with students on how to use programs or apps for annotation, etc. during digital reading. I am looking forward to learning more about how others incorporate digital texts and digital reading into their classrooms, as I seek to figure out what fits best with what I want to accomplish with students. I too am looking forward to learning from others about how they incorporate digital texts and digital reading, especially from those who do so without a 1:1 classroom. I began using Google Classroom this past year and am hoping to start blogs this year. I'm excited for us to be learning together! Me too, Stephanie! I am definitely looking forward to seeing others' examples as inspiration and ideas. I enjoyed reading your post, but LOVED the post about your blogging! For those hesitant to take it to the digital world, your printed organizers off a printed alternative. I could really envision what these might look like posted across a classroom. I love it! Thanks, Stephanie! The kids made really quality comments when blogging on paper too, because I think the connect that you are writing this to a real person with real feelings was much more obvious. Glad you found the post helpful! There are many things to learn, I agree, Katie, but with blogging you've made a start, & the students are now comfortable with the tech, I assume. This is going to be fun learning isn't it? The kids loved blogging and learned quickly. I want to figure out how best to integrate that with more digital texts and projects. I loved the simplicity of the comparison of the two students in the beginning of the book --- because we all have Marissas!!! I found the list of reflective questions about digital text inviting and helpful. Provides us the opportunity to be more intentional in our planning. I think the steps you have taken in your classroom are helping move you forward to a digital workshop! Introducing blogging (authentic writing experience) and incorporating digital texts during read alouds provide that shared experience! I guess, think about what your next step may be ... I understand the challenge of having limited technology. After reading several responses, you are not alone! Seek other teachers out in the same boat and I know we'll be able to arrive at some great ideas!! Thanks for joining in #cyberPD again this year! We appreciate your thoughts! Thanks, Michelle! Exciting to be here for another round of #cyberPD. I am also doing the Digital Student Portfolios book club this month, which I think is a perfect tie-in for where to go next. Moving the reflection piece into the digital realm could really help my kids see where they started and where they are going. There seems to always be something new to learn. It's quite a journey. We are not a 1:1 school, but there is a plan to get us there. In the last five years device accessibility has improved greatly as district leaders have realized what we are trying to accomplish. Everyone from our principal, our PTO, to our technology team - and even individual teachers - have worked to find ways to continue to improve. It's a journey. I'm looking forward to learning from our group as we read and talk about Digital Literacy: What's Essential. I'm so glad you are joining the conversation. P.S. Kudos to you for your effort commenting. As I've been working my way around the #cyberPD community I see you have been nearly everywhere. Thanks! Aww, thanks, Cathy. I started my blogging journey with #cyberPD last year, and I knew what it meant to me to start getting comments and feedback. It's a great community to grow in! So happy to have you joining us again! I love that you are being so thoughtful and innovative as you try things with your students, even with limited technology. It truly puts the emphasis on authenticity, intentionality, and connectedness!! Thanks, Laura! Really looking forward to developing a plan for implementation.